Jesus Christ, my Lord God Almighty, who was, and is, and is to come. I give You all the glory and honor that is due to Your name. I praise You and surrender my life to Your will. Father, You are so awesome! Today I bow humbly before Your throne of grace, where I receive Your mercy and cry out with a heart that is broken. Help me to understand the calling You have placed on my life and my purpose on earth. 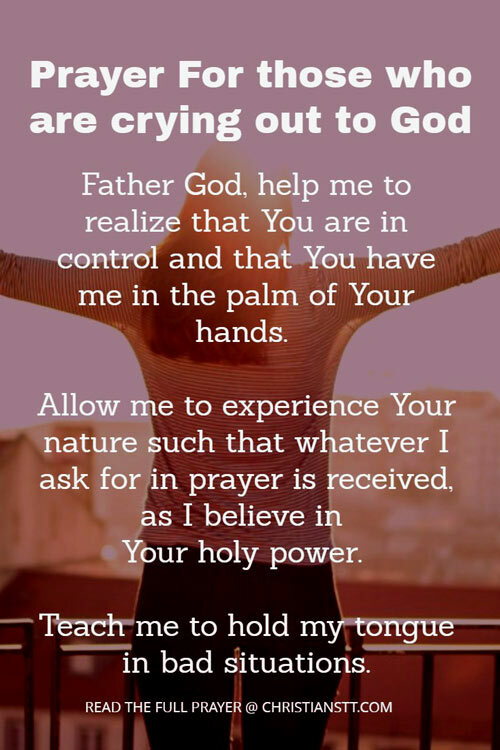 Father God, help me to realize that You are in control and that You have me in the palm of Your hands. Allow me to experience Your nature such that whatever I ask for in pray is received, as I believe in Your holy power. And when I find it difficult to forgive the people who have wronged me, Father, allow me to hear the still, small voice from within, ministering to me at every junction in my life. Teach me to hold my tongue in bad situations. Psalm 18:6 In my distress I called to the LORD. I cried to my God for help. From his temple he heard my voice; my cry came before him, into his ears. Psalms 61:2 From the end of the earth I call to You when my heart is faint. Lead me to the rock that is higher than I. Guide my steps, gracious God and let Your will be done, as it is in heaven. May my cup overflow with the unmerited favor of Your goodness. I declare, Abba Father, that you will raise me from my brokenness, in Jesus’ most magnificent name, SO BE IT… Amen and Amen! Prayer – I am not a Loser!